Chicken schnitzel has always been a favorite in my family. When my kids were younger, schnitzel was a giant chicken nugget, to be grabbed in hand and dunked in lots of ketchup. Back then I don’t think any of us realized the wide global reach and popularity of schnitzel. Not every country calls it “schnitzel,” but they all use a similar recipe: boneless, skinless, beef, chicken, pork, turkey or veal is tenderized by pounding it into a thin cutlet. It’s then breaded and baked, sautéed or deep fried. It’s crisp on the outside and tender within – totally irresistible any way you serve it! In Italy they it “Chicken Milanese.” A big, thin crispy sheet of chicken schnitzel that practically covers the plate is topped with an arugula and cherry tomato salad with lemony dressing. The Japanese version is “Katzu.” After the chicken is fried to golden-brown perfection, it’s sliced into strips and served with a big scoop of steamed rice and a green vegetable. Chicken schnitzel in Israel has a good amount of sesame seeds in the breading and is sometimes offered as a filling for shawarma. Wiener Schnitzel is the famed Viennese version, made from veal. 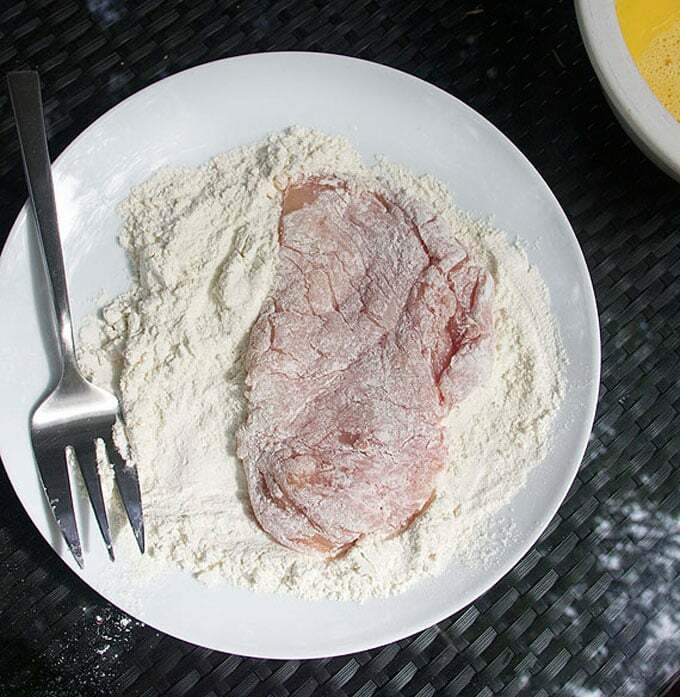 The first step of making good schnitzel is to pound the chicken until it’s nice and thin. I don’t have a mallet, but my rolling pin works really well. Putting the chicken into a large baggy for pounding, is a great way to keep chicken juices from spraying around your kitchen. Tip: don’t zip the baggy or it might pop. After the chicken cutlets are pounded to 1/3 – 1/4 inch thickness, set up a dredging station with a plate of flour, a bowl of beaten eggs, and a plate of bread crumbs. Coat each chicken cutlet lightly with flour. Then coat with crumbs. Your chicken schnitzel is now ready to cook. You can bread all of your schnitzel ahead of time and keep it covered in the fridge for a few hours until you’re ready to cook it. Schnitzel is best served right after it’s browned. If you have leftovers, be sure to make a delicious “schnitzelwich” – schnitzel on a roll with lettuce and mayo or Russian dressing. Cool mornings have started to mingle with the hot August afternoons here in New England. I can feel myself waffling between hanging on to the lazy days of summer and gearing up for a busy Fall. I’ve already started nagging my kids about getting ready for school. Soon our family will be in full swing of the new season – each of us diving head first into our various endeavors. Coming together around the family table for a good comforting dinner will feel better than ever! Here’s the recipe for Chicken Schnitzel. If you try this recipe I hope you’ll come back to leave a rating and comment. I’d love to know what you think! Thin scallops of chicken, breaded and sautéed until golden brown on the outside, tender inside. Serve with buttered noodles and salad. 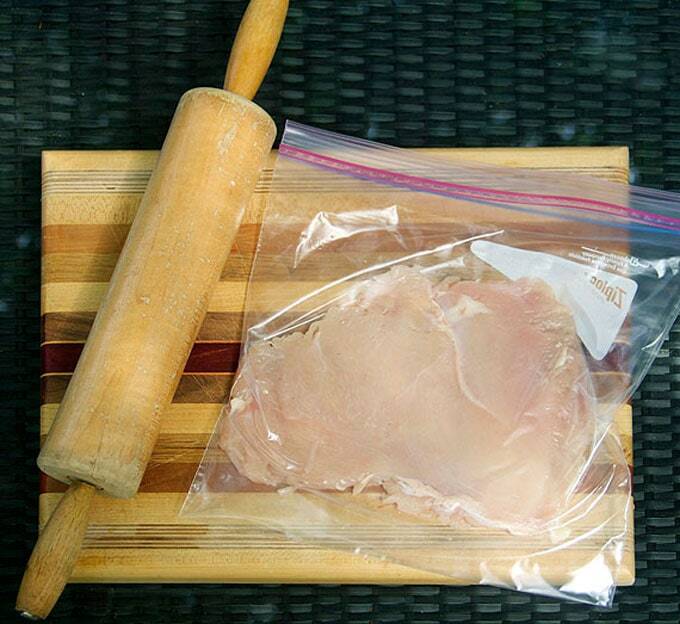 Pound the Chicken Place a chicken breast half inside a large plastic ziplock bag. Lay it on a flat surface. Pound evenly with a meat mallet or rolling pin until you have an evenly thin scallop, 1/3 to 1/4 inch thick. Transfer scallop to a plate and repeat with remaining chicken breasts. Bread the Chicken Cover a large baking tray with foil or wax paper. Pour the flour onto a large plate. Crack the eggs into a large wide bowl and whisk. Pour the breadcrumbs onto a large plate. Season the chicken with salt and several grinds of fresh flack pepper. Lay a piece of chicken onto the flour plate. Turn it over to coat. Shake off excess flour. Then dunk the chicken into the eggs to coat. Let the excess drip off. Then press the piece of chicken into the crumbs. Turn to coat the other side. Lay the breaded chicken on the prepared tray. Repeat with remaining chicken. Cook Chicken In a large cast iron or non-stick skillet, heat 4 tablespoons oil over medium-high heat. (for speedier cooking, work with two skillets simultaneously). 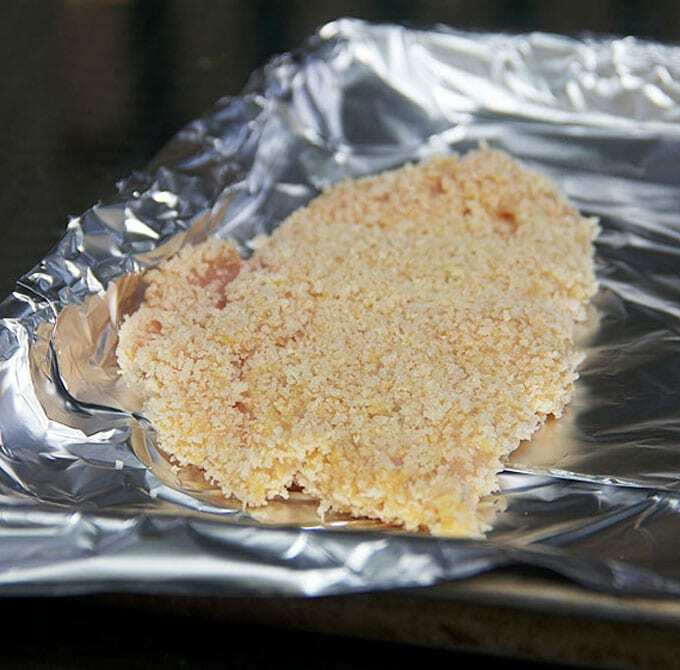 Add 1-2 pieces of breaded chicken to the skillet (or however many fit in a single layer.) Brown each piece for 2-3 minutes per side, until golden brown and cooked through. Transfer to a paper-towel-lined plate. Repeat with remaining chicken, adding more oil when needed. You need a good layer of oil over the bottom of your skillet to get a crisp crust. Serve with noodles or topped with arugula salad. Sprinkle with lemon juice and freshly grated parmesan cheese, if you like. Enjoy! On the note of family dinners, I’m happy to announce that I’ve joined The Sunday Supper Movement. Their mission is one that I strongly believe in – to bring back Sunday Supper Around the Family Table. Every Sunday they bring you great recipes and inspiration for Sunday suppers. I’ll be participating whenever I can. The members are a group of talented food bloggers who all appreciate the power of food to bring people together. Listed below, you’ll find links to their blogs with all of their best recipes for the back-to-school season, to help you roll happily and hungrily into Fall. Enjoy! Can’t go wrong with schnitzel and these instructions make it even easier. One of my favorite dish. I loved it and made it every Sunday. Hi Elaine, I can’t give you exact nutritional info but I can tell you how to cook this the healthiest possible way, with the least amount of fat and salt. Firstly, omit the salt from the recipe and add salt to the finished dish in whatever amount is acceptable for your diet. 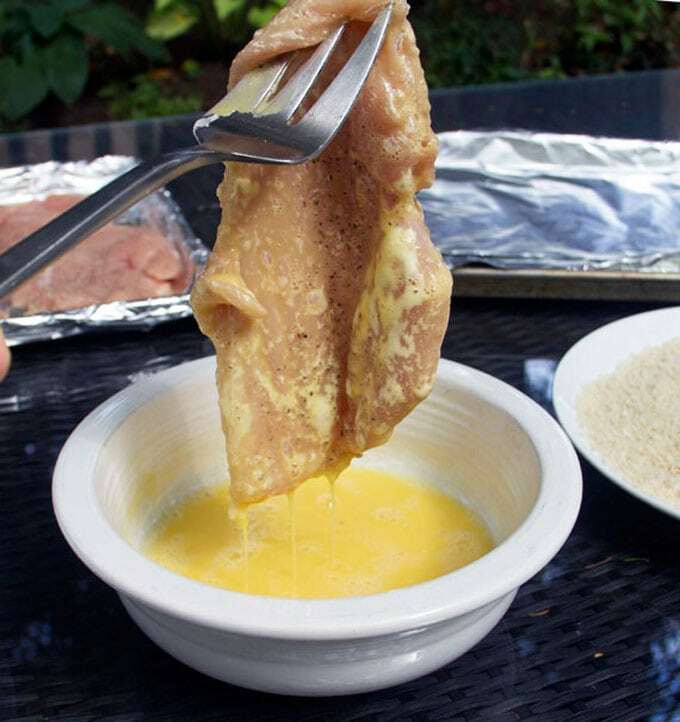 As for the fat, the main fat in this dish is the fat from the egg yolks and the oil that the schnitzel is fried in. If you’re concerned about too much fat, use egg whites only when you flour and bread the chicken. Then, for frying the schnitzel use the minimal amount of oil. Spray your skillet with a little cooking spray and get the outside of the chicken brown. Then transfer the browned chicken pieces to an oiled baking pan. Spray the tops of the chicken piece with a little oil. Bake in a 425ºF oven for 5 minutes. Flip pieces over and bake for another 5-6 minutes, until cooked through. I hope that helps! Simple + Delicious = Perfection! Served this tonight with buttered noodles. It was a home run! We didn’t call them schnitzel, but these cutlets have been a favorite in my family for decades. My mom used to prepare them and she passed the simple process down to me. I’ve added a few steps (Like you I pound the cutlets), but when I eat them, they definitely take me back to my childhood. Lisa your chicken looks so moist and delicious! Your schnitzel really looks amazing. It’s perfectly crispy and browned! This is one of those recipes that proves that simple ingredients can create the most amazing meals! I love a good schnitzel! This looks delicious and definitely a kid-pleaser! I had no idea schnitzel had such global reach! 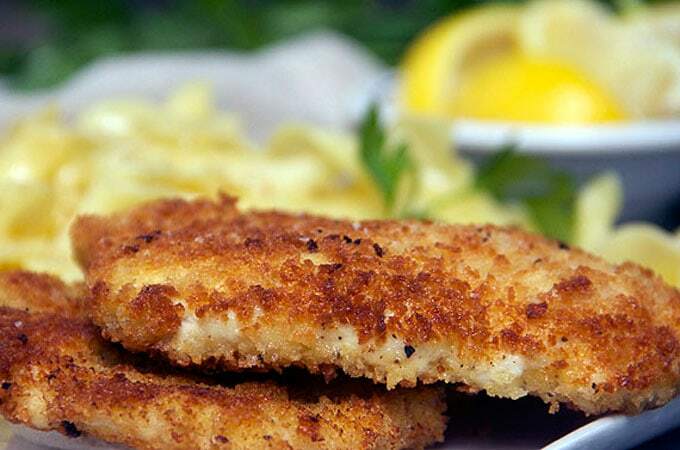 I love learning new things…and your schnitzel is so golden and perfect looking – YUM! Oh I love this dish. I will need to give this recipe a try with our gluten free breading. This looks amazing! I bet my family would love this! 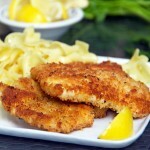 My mouth is watering looking at this recipe, I haven’t had chicken schnitzel forever!! Okay now you know that I HAVE to make this recipe using my almond meal mixture. You are so right about all the other countries that make something similar. I’ll have to try your almond meal mixture for a gluten-free version, Marlene! In my family, we referred to it as milanese, and I never knew schnitzel was the same thing, basically. I love that you referred to this as a giant chicken nugget; that name wins in my book! I was surprised to find out how many different countries feature schnitzel in their cuisine. I only mentioned a few but there are literally dozens. Chicken Milanese is one of my favorites! I did not know that ‘schnitzel’ was part of the Sound of Music lyrics. Shows you how closely I paid attention to the little details of the song…like the words! 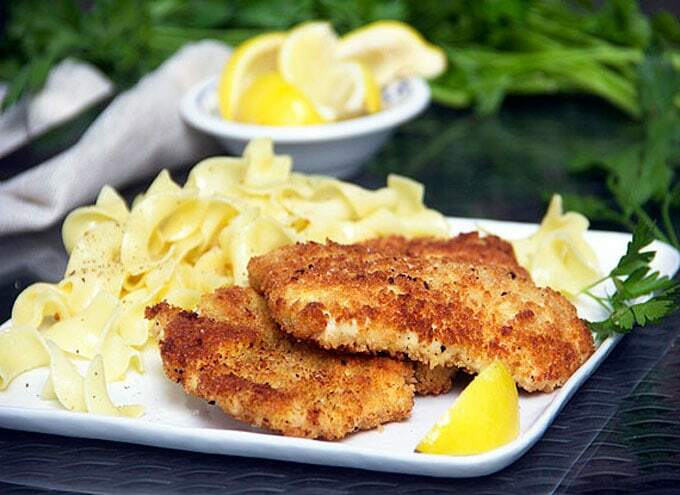 Thank you for sharing the styles of schnitzel and for posting such a user-friendly recipe. I can’t wait to give it a try…and I will be serving mine with buttered noodles, too!